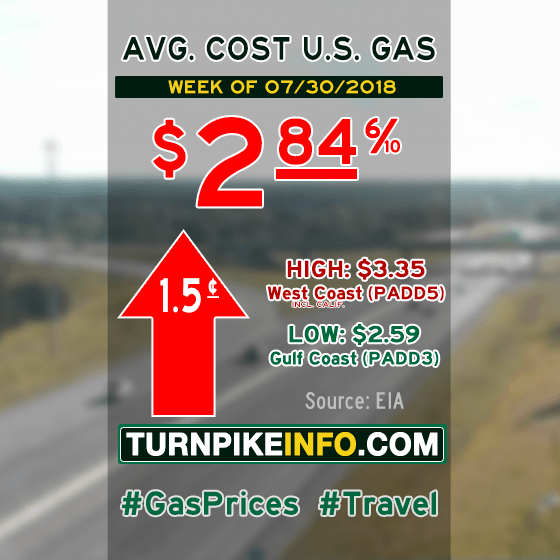 Fort Lauderdale, FL – After a week in which drivers were given a little break at the pump, gas prices reversed course this week and took a little back. According to the U.S. Energy Information Administration, the average price for a gallon of gas went up nearly two cents per gallon to about $2.85. Prices went up in most regions, although drivers across the Rocky Mountains and the West Coast enjoyed a price break. Elsewhere, price increases ranged from just over a penny per gallon to about two cents per gallon. For drivers across the Midwest, used to volatile price changes, this week’s E.I.A. survey shows prices jumped nearly three cents per gallon, the highest regional price increase in the U.S. The cost of diesel went up slightly for truckers in most regions, although prices dipped slightly across the Rocky Mountains. For most truckers, the E.I.A. reports the average cost for a gallon of diesel ticked upward nearly a penny per gallon to about $3.23. This week’s average fuel prices for all regions are shown below, as gathered from www.eia.gov.